Second post for today. My SSS challenge post is here! Welcome back to day #3 of Taylored Expressions October sneak peek! Here are my sneak peek day #1 and Day #2. Today I am showcasing two more products from the new release. The first product is a die set called By the Fireside Holidays! This is a building die set which works with the new By the Fireside Santa die set and By the Fireside die set released previously. And here is my card using the dies. I am lazy and I kept procrastinating about making this card as there were too many die cuts and assembly. But I had a deadline and made this card the last one. To be honest, I throughly enjoyed making this card. I planned out the card, then listed all the die cuts I needed and the colours, die cut them all out, sponged the die cuts with daubers and assembled the card. I don’t know why I kept postponing making this card! It was so much fun. And I think this is my best ever Christmas card. Pretty Proud of it. 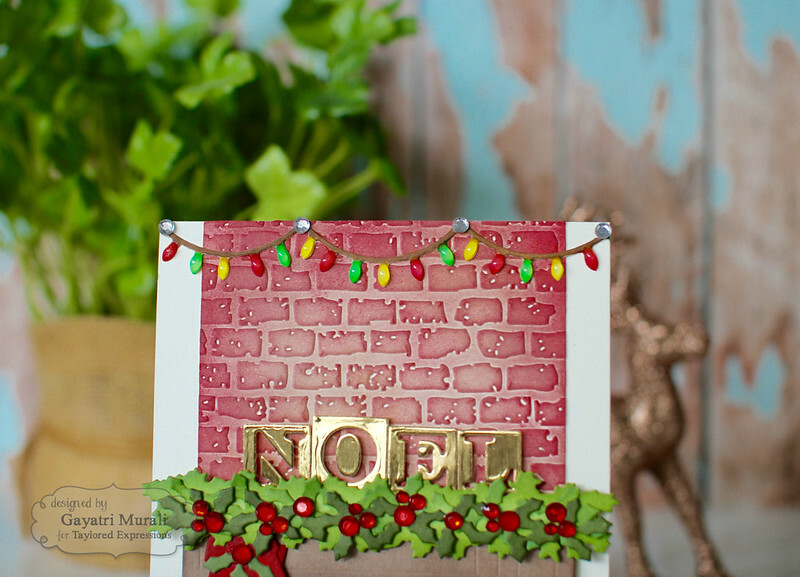 Apart from the process of die cutting, sponging to add depth to the die cuts, I also embossed the wall using Brick embossing folder and sponged inks. To embellish the card, I added red rhinestones and glossy accents to the lights and candle flames. Here is the list of supplies I used on the card. The second product I ma show casing today is Plaid Embossing Folder. I LOVE plaid as you would have seen from my cards. Plaid is especially awesome for Christmas cards. 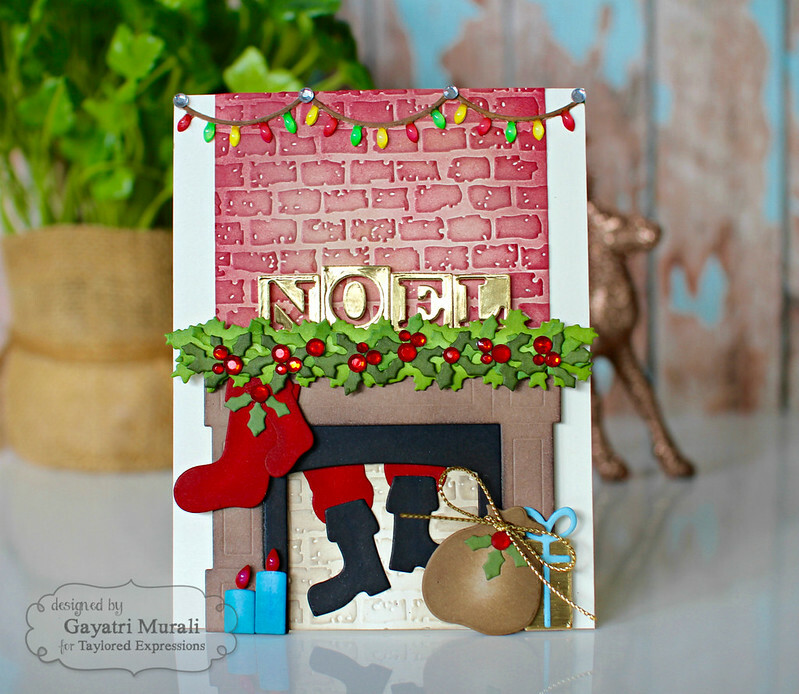 Here is my card using the embossing folder. I embossed a white panel using the Plaid embossing folder and sponged Salty Water Taffy and Mint Julep TE dye inks. 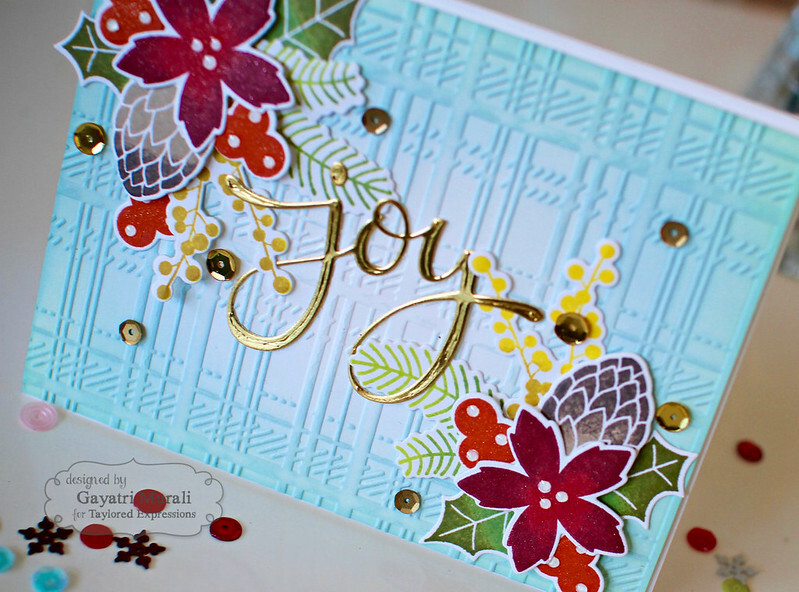 The focal point is Joy die cut from gold foiled cardstock die cut using the new Joy Script die. 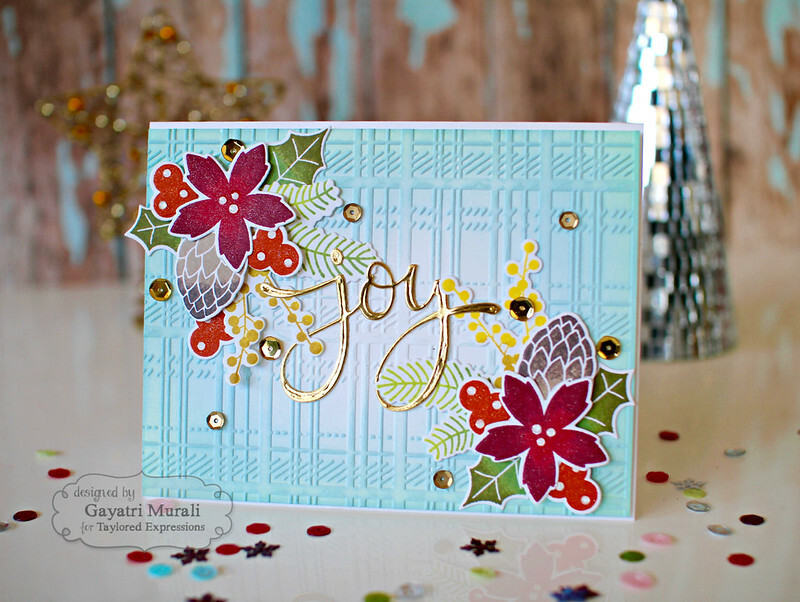 To frame this die, I used cluster of stamped and die cut images from the new Holiday Florals stamp set. I used TE dye inks and rock and roll technique to stamp these images. For example the large flower is stamped with Cherry Pop dye ink and rolled on the edges on Mulled Wine dye ink. this adds depth to the images. I then die cut them using the coordinating dies. Finally I used sequins from Wedding collection to embellished the card. I have listed all the supplies I used on this card below. Will see you tomorrow for the release! These are just stunning Gayatri. 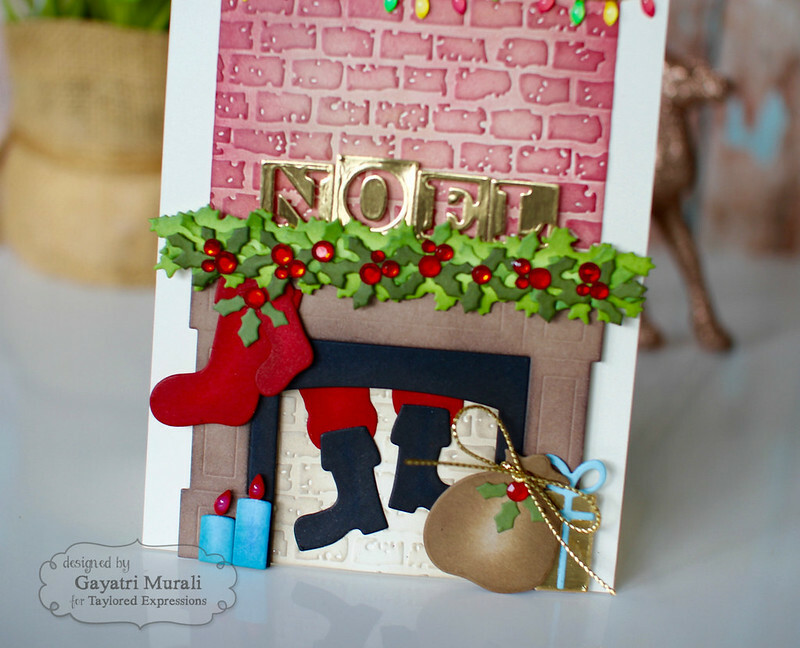 I always love the wonderful work you do with embossing folders – you have such a wonderful knack of making them POP!! You're cards are so beautiful. what cardstock do you use for the gold lettering. It just makes the letters pop. Wow!! So much stunning detail on both cards. Great job. Outstanding cards, I especially love your santa in the fireplace, and had to stop by and tell you that you did an outstanding job on that one!